I offer four forms of divination, all of which relate to Kemetic traditions and Gods, but none of which are authentically ancient — these are all modern oracles. The fees for these oracles vary according to the complexity and conditions of the individual divination system and are noted in the descriptions below. All profits from these divinations will be donated to the House of Netjer for the support of its home temple at Tawy House. The Fedw (Kemetic for “four”) is an official Kemetic Orthodox divinatory oracle created by Rev. Tamara Siuda for use by the Shemsu of the House of Netjer. The oracle is cast using a set of four sticks, hence the name, and the answer is returned by the diviner’s Parent God(s) — in my case, Bast. The Fedw is a very simple, limited oracle best suited to yes or no questions that are direct and to the point. Questions that are too complicated or that have variable answers will usually receive a confused response or no answer at all. The Fedw is also not to be used for medical or legal questions, or as a substitute for the Kemetic Orthodox Rite of Parent Divination. One additional caveat: Bast can be extremely tetchy about responding this oracle, and it’s entirely possible that She’ll simply refuse to answer. On the plus side, this oracle is free. The Wenut Oracle was created by me via direct inspiration from the Goddess Wenut, Eye of Ra and one of the Seven Arrows of Bast. It consists of twenty-five nickels, which are tossed and then read according to the patterns of heads and tails. 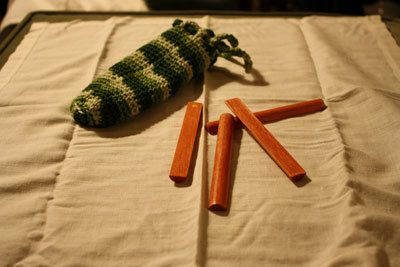 This oracle is also quite simple in scope, although not quite as simple as the Fedw. While it can handle yes or no questions, its primary function is to reveal the dance of order/stability/positivity/life/peace versus chaos/change/negativity/death/conflict in a particular situation. It can give a sense of how long it will take to arrive at a resolution, how involved and/or difficult the process will be, and the likely ultimate outcome, assuming that nothing changes in the interim. 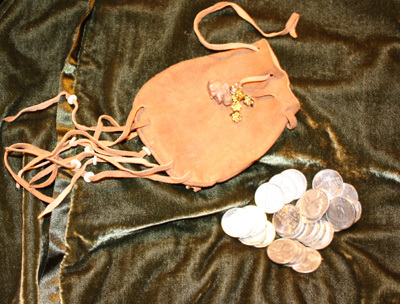 A casting of the Wenut Oracle costs US$8.00. This oracle was inspired by Bast via a dream; I tell the full story (along with as much explanation as I can give as to why this is the “Phoenician” Bast Oracle) here. 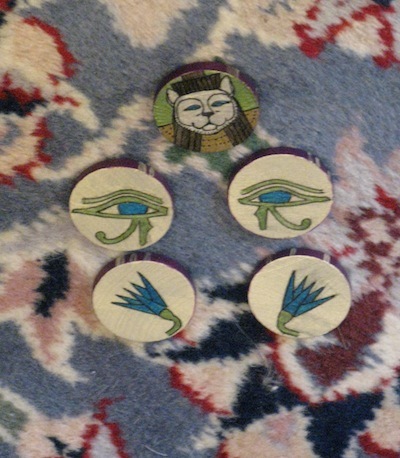 The oracle consists of five tokens: two udjat eyes, two lotuses, and one aegis of Bast. There are two different readings, a single-token reading and an expanded reading that involves casting all five tokens. The former is a yes/no reading that’s very slightly more forthcoming than the Fedw, while the latter offers a brief statement of Bast’s thoughts on the querent’s question. The expanded version is not nearly as in-depth and detailed as the Wepwawet Stone Oracle, but it’s somewhat more flexible than the Fedw or the Wenut Oracle. Because this oracle is still in “beta-test,” both types of readings are currently free. The Wepwawet Stone Oracle was also created by me, this time with inspiration from the great jackal Wepwawet, the Opener of the Way. 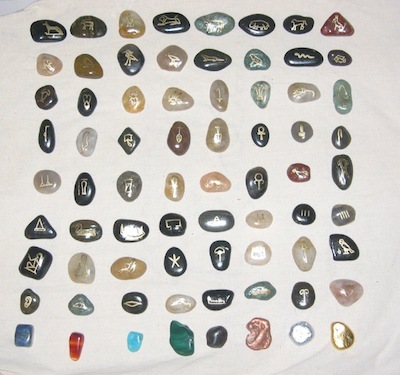 It consists of 64 “glyph” stones and 8 “treasure” stones, each with individual meanings based on traditional Kemetic symbolism. A selection of these stones is cast on a cloth marked with symbols of various Names of Netjer and the result is then intepreted. This oracle is much more complex than the previous two, on a par with Tarot or runes, and can handle both broad-based and specific questions, sometimes going into great detail. A Stone Oracle reading costs US$30.00. An alternate form of divination with this system consists of three stones drawn and read together, without recourse to the divining cloth. This is just like a three-card Tarot draw, but with a Kemetic flair. A three-stone reading costs US$15.00. These readings are provided for spiritual insight only and are not meant to replace professional advice or your own common sense. Please consider carefully before taking any actions based on these divinations. Also, bear in mind that the future is always in motion and subject to change — no answer is absolute. To request a reading, please email me at shefyt@firecat.net.